Rivers State Governor, Nyesom Wike on Thursday swore-in four new commissioners to further strengthen the machinery of government in the state. The Governor also swore-in Chief Boma Dappa as the Caretaker Committee Chairman of Degema Local Government Area. Performing the swearing-in ceremony at the Government House Port Harcourt, Governor Wike said there would be a minor cabinet reshuffle. He charged the new commissioners to see their appointments as a privilege to serve the people of the state and not an opportunity for self enrichment. The governor urged the commissioners to establish themselves as persons who are known for the development of the state. He said: “These appointments are not opportunities for appointees to enrich themselves. If you attempt to enrich yourselves, there will be consequences. “Anyone who attempts to derail our vision, we will not notify the person before he is shown the way out. We are determined to move the state to the next level “. He called on all the new commissioners to show loyalty to the administration as they work towards a New Rivers State. “I demand total loyalty. If you divide your loyalty, you will not be in my cabinet. This administration is determined to actualise her vision for the state “, he said. 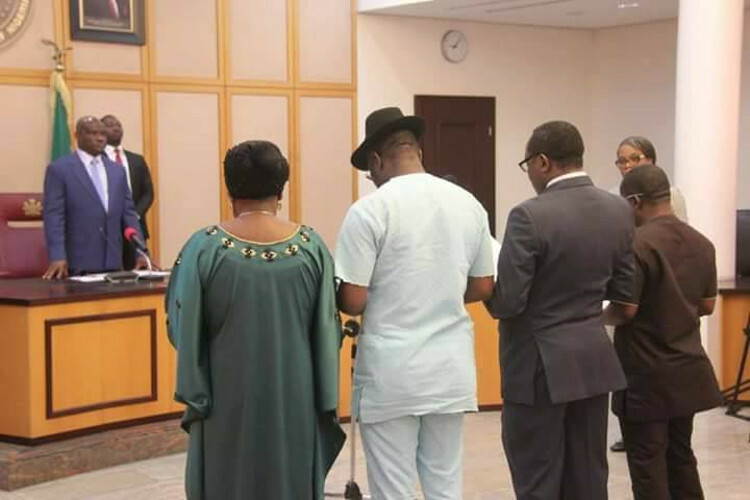 The Commissioners sworn-in by the Rivers State Governor include: Mrs Nancy Nwankwo, Chinyere Igwe, Michael West and Dr Reason Onya. He directed the Caretaker Committee Chairman of Degema Local Government Area to pay salaries and work with security agencies to maintain security in the area. He urged the Degema Council Chairman to ensure the regular payment of salaries, saying that salary payment should not be compromised.